When I graduated from 8th grade, I received a 14 karat gold charm bracelet from my Gram, with a charm on it. It was a gold filigree cross. That same day, I received a shamrock from my parents, a “13” from the family I babysat, and I was slowly on my way to a vast collection. In high school, I managed to gain an apple from New York, an enameled Edelweiss flower from Switzerland, and a cukoo clock from the Black Forest. In college, I scrounged while backpacking for a gondola from Venice, a bagpipe from Scotland, a beer stein from Munich, gold from a creek in Canada where a cousin lives, an M from a necklace of my Gram’s from the 70s, and a few that are sadly now so distant to me and can no longer be recalled. It stayed in either my jewelry box or my mom’s. I wore it for special occasions, until I was in my late 20s, when I pulled it out and wore it often. I loved the noise, and the reminder of where I came from, where I have been, and where I was going. Until it mysteriously disappeared the fall of 2007. There are three schools of thought on where it went. I hadn’t worn it for a while, and I had a cleaning crew over. It could have been taken then. The second was I think I brought it to my first summer at Bread Loaf but I am not sure. We had some strange doings and random rifling through stuff, and it perhaps was taken. And finally, I could have simply put it in a pocket of a coat, pants, sweater, and gave it to Goodwill. Sadly, I am pretty sure it was one of the first two. I tore up my apartment. Mom tore up my childhood bedroom. Gram tore up her guest room. I begged her to dream about it. I began searching online, knowing perfectly well however that IF someone did steal it, the charm bracelet was no longer in tact. Gold was peaking at the time, and some of my charms were just gorgeous. I ached a little more for my bracelet, each day. Today, when I am in a thrift store, or even walking by an estate jewelry store, I always look. The searching dream in the early morning before I wake for work never seems to end. 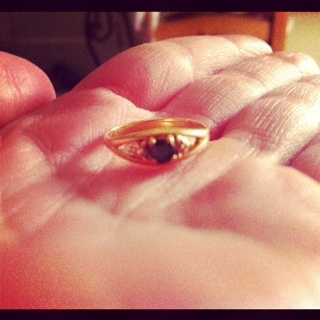 Five years of searching, and I finally accept that I lost something so incredibly precious. My mom came to stay with me two weeks ago, and told me she had something for me, but it hadn’t arrived until after she left to drive to San Francisco. You could tell she wanted to tell me. So I let her. I really had no idea what I was walking into. The backstory is Gram received a gold Canadian dollar for her 70th birthday from her sister. It’s one pure full ounce of gold. At the end of her life, it was too heavy and gaudy for her to wear, but it was left to my aunt and mom. After careful deliberation, and the absolute peak of the gold value, they decided to sell it and split the money, each buying something that they could wear and pass to my cousin and me. Mom hummed and hawed over what to do with the money, and then my aunt suggested it. Mom told me about the beautiful new gold charm bracelet that she picked out. That it had a gold butterfly charm, the symbol that we still associate with Gram, and that it was from her. Do you believe in reincarnation? I do. She wanted me to start over, to stop searching. And so I have. What was so precious will never be found again. But I get to start again. I know my emotional attachment to my first bracelet IS worth its weight it gold. My dad always said that it’s good to leave one thing unseen when visiting a foreign place–that way, you have a reason to return. Looks like I have a lot of places to see once again. It’s not the original, but it represents even more now than my old bracelet ever did. And I have the tears–from the past seven years up to when Mom shared with me her gift–to prove it. I have enjoyed your blog so much I have nominated you for the Beautiful Blogger Award. Please check my site for the requirements of acceptance. Congratulations! Thanks again for this! I am glad that you enjoy my blog! No one else – great song from an underrated weezer album! It’s one of my favorite albums. I love Weezer. Thanks for stopping by!